Residents of a popular downtown Nashville apartment complex have been given a 30-day eviction notice, after the Market Street Apartments have been sold to make way for a new hotel. 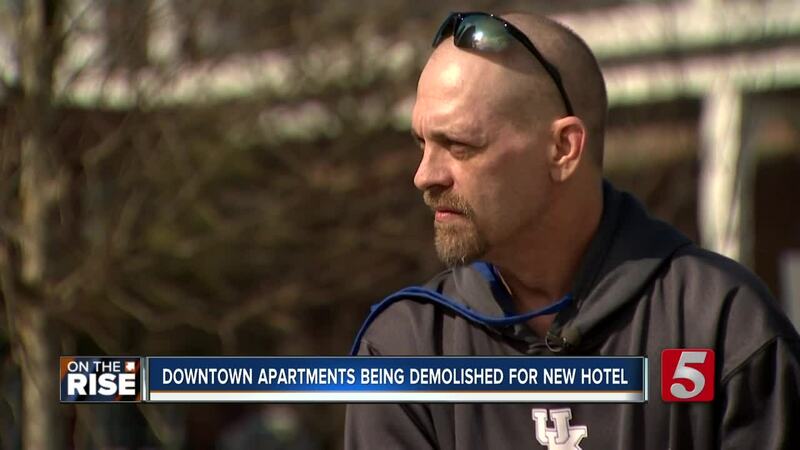 NASHVILLE, Tenn. (WTVF) — Residents of a popular downtown Nashville apartment complex have been given a 30-day eviction notice, after the Market Street Apartments have been sold to make way for a new hotel. The building, managed by Robin Realty Company LLC for the last 40 years will be demolished soon to make way for a Four Seasons Hotel. As a result nearly a dozen tenants have been told they have to vacate the building by March 10. "It's a treasure. Everybody in the building we get along great and there's a lot of love in the building. We're a close knit family so seeing that go away is going to be hard," he said. Clark and other residents have known for years that the building's days were numbered. But it wasn't until last week that they were given a firm move out date. For Michael, the most difficult part about being forced out of the building, is finding a new place to live in a similar rent. Like countless others in Nashville, he is now being pushed out of the city's urban core. "It's just crazy trying to find a place. We're pushing out ordinary people."